Tesla’s shares are diving after it announced an offer to buy Solar City, the solar-power company co-founded by Elon Musk. remake transportation using the electric car, freeing planet Earth from a dependence of fossil fuels using solar power. 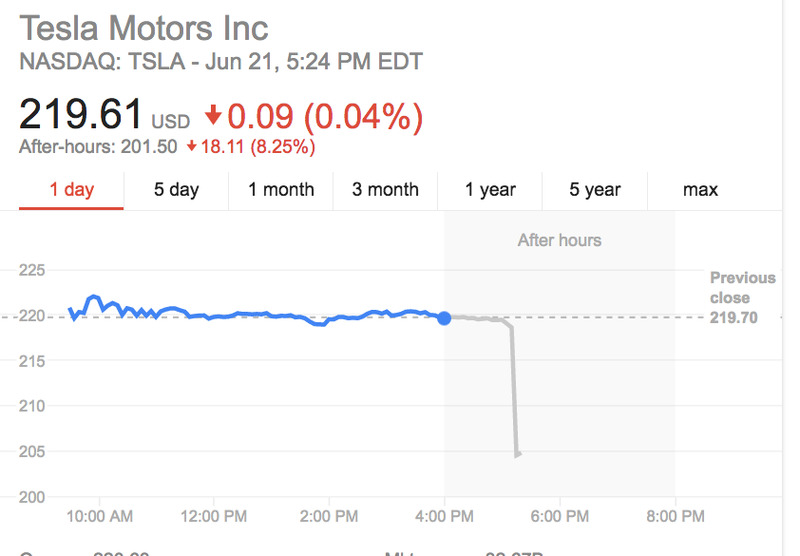 According to Musk, the new company will operate under the Tesla banner. “Tesla will have three product categories: Cars, batteries, and solar power,” Musk said on a call with members of the media. Tesla believes the deal, which Musk values at between $2.5 to $3 billion, will create synergy for both Tesla and customers. According to Musk this will allow Tesla to integrate the design and production of future products across the company’s businesses. Tesla offered to buy Solar City for $26.50 to $28.50 a share which 35% over where Solar City ended trading on Tuesday. Solar city’s shares jumped 22 per cent in after hours trading. 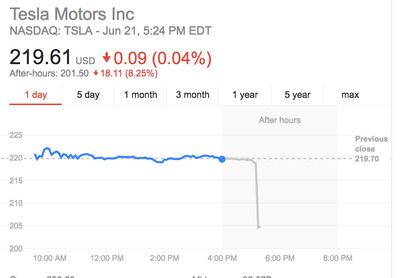 Tesla’s shares dropped 10%. We would be the world’s only vertically integrated energy company offering end-to-end clean energy products to our customers. This would start with the car that you drive and the energy that you use to charge it, and would extend to how everything else in your home or business is powered. With your Model S, Model X, or Model 3, your solar panel system, and your Powerwall all in place, you would be able to deploy and consume energy in the most efficient and sustainable way possible, lowering your costs and minimising your dependence on fossil fuels and the grid. We would be able to maximise and build on the core competencies of each company. Tesla’s experience in design, engineering, and manufacturing should help continue to advance solar panel technology, including by making solar panels add to the look of your home. Similarly, SolarCity’s wide network of sales and distribution channels and expertise in offering customer-friendly financing products would significantly benefit Tesla and its customers.